According to the Barnes manual number four the max load with that bullet is 66 grs for 2842 with 2217 or H 1000 which are the same powders. BC of that bullet is .392. A starting load of 59 grs is supposed to give 2621 fps which makes your load about right for 62 grs. Not sure on accuracy with the heavier charge but you can only but try a few for speed and accuracy. No worries, by going a bit higher than the 64grs you have gone to you may find the group closes up again, but you will increase recoil the faster you push them. The only advantage with the extra speed is you will have better expansion especially as the range increases. Good luck and look forward to your post. Those Barnes bullets should be really good on Feral Cattle. Hay there rigga that's a shame they fouled the barrel that bad. Sounds as if the 154 gr Hornady works OK. Have you tried the 160 gr Noslar Partition bullet, you should be able to push them to around 3000 fps and they are a good penetrating bullet, once again good on those big scrub bulls. I used to load them in my 7mm Mag with AR 2217 at 72 grs and the 160 gr partition for 2995 fps average, this is over the book max but safe in my rifle. If you try this load work up from say 65 grs and see how it goes. Another good load is 65 grs of AR 2213SC with the 160 gr partition for about 3000fps. Once again over book max so work up from say 62grs watching out for pressure signs. My rifle is a 24 inch barreled Mod 700 Rem. No worries, the partitions have been around for a very long time and you don't hear to many horror stories about them. They are designed to open up quick after impact to create a good wound channel then when the expansion reaches the partition the remaining bullet can penetrate deeply. 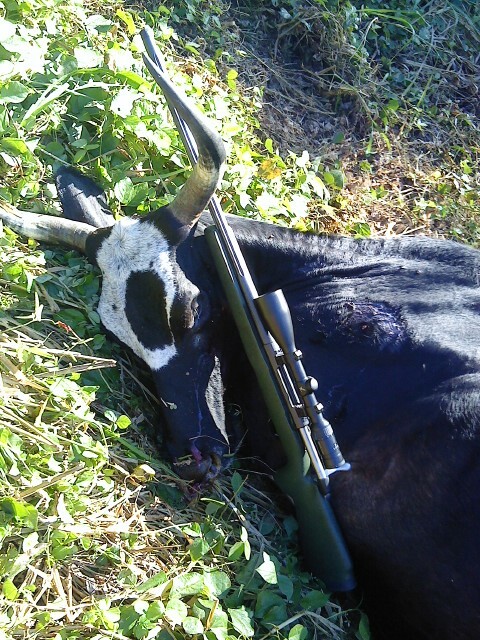 I have shot a few deer with them in my 7mm Mag with good results and we have used them a lot on deer in the 85 gr weight in 243 also with good results. In the 270 Win the 130gr bullet is great. I think they would be better allrounders than the 154 Hornady as they are a controlled expansion bullet but in saying that you have had good results on scrub bulls with the 154gr bullet so who knows, only one way to find out do a comparison of the two. 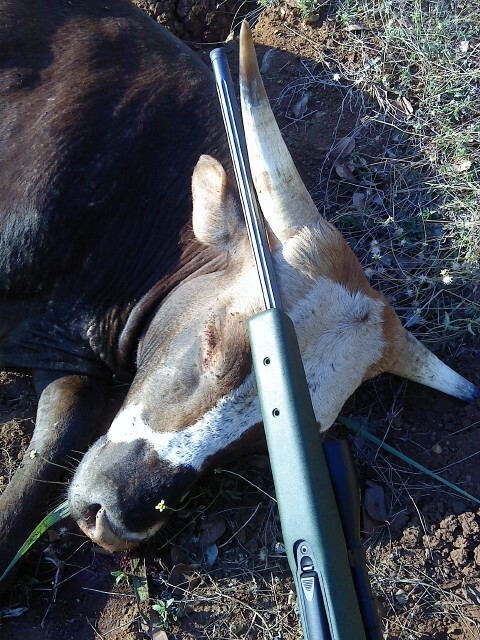 The ORYX is meant to be a tough bullet so should be ok on Bulls. Good luck keep us posted chuck in a few pictures of the bullets performance on the bulls , would be real interesting. Are they any good for eating? I remember over here a mate shot a young bull in the Motu many years back and they cooked some up but it was to tough to eat. Maybe if it had been aged it would have been ok ? Are the scrub bulls a problem in your area? Yes I could imagine a mob of cattle would make a horrible mess of the sugar cane. That one in the picture sure looks a bit skinny.